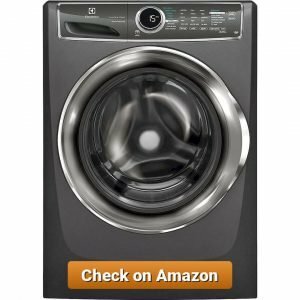 You’ll need plenty of time to find the best washing machine, and you’ll waste more time if you have to go to an electronics store. We have researched dozens of models to get the 10 best washing machines on the market today. 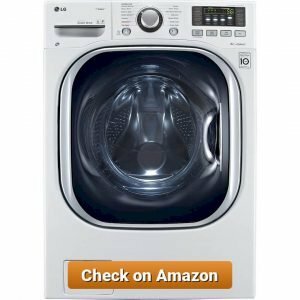 What is the best washer for 2018? Here is the list, enjoy it! Check our recommendations for the best rice cookers! What it feels like to have a pair of stylish machines in your laundry room? LG WT1801HVA_DLEY1701V is the best top load washing machine on the market now. Each of the machines has its own duty of washer and electric dryer. With this LG top load washing machine, you get the best of both performance and appearance. LG WT1801HVA_DLEY1701V has the features of the best top load washing machine in its class. The 5 cu ft. top load washer has an option of 12 wash cycles and 15 wash options. It includes steam cleaning, TurboWash®, Sense Clean System, and Allergiene™ wash. The big capacity with the turbo system will save more time on doing laundry. The system saves up to 30 minutes per load which means more household efficiency. The NeveRust™ technology from LG guarantees a rust-free drum which is made of stainless steel. The design is made to make sure there are no clothes stumble on each other. LG wants to make sure its customer gets the best part of the machine, the 10-year warranty is enough to reassure that the direct drive motor should work perfectly for a long duration. There is no single fabric that cannot be washed with the LG WT1801HVA_DLEY1701V. the 12 washing programs support washing for cotton or normal, bulky or bedding, casual, speed wash, sanitary, clean, Allergiene™, wool, heavy duty, Bright Whites™, and Towels. There are clothes stains that can only be washed with particular water temperature. It is why the LG WT1801HVA_DLEY1701V has 5 settings for temperature from extra hot, hot, warm, cold, and tap cold. All washing temperature would be rinsed with cold water. The smart technology of LG would adjust the water level to the size of the washing load. Different spin speeds wash assist different washing loads from extra high, high, medium, low, and no spin. Being the one of best brand on the household appliance, LG has developed Steam Technology and Allergiene™ Cycle. The right use of those technologies will remove at least 95% of pet sheds and dust. It also kills allergens that are found in the most household. In summary, the features of this best top load washing machine will be suitable for households with babies and pets. While being efficient in time and energy consumption, the LG WT1801HVA_DLEY1701V actually employs a big amount of water to work. Another downside, the heavy duty washing machine does not work well for light washing load. The big capacity indeed works better for massive laundry amount. 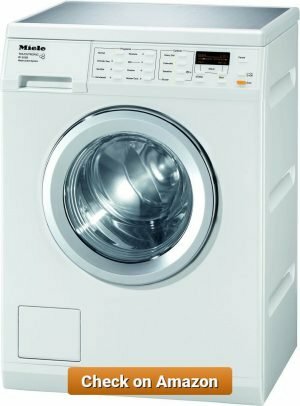 With a large capacity and a dozen of washing option, the LG WT1801HVA_DLEY1701V will be most suitable for heavy duty household with a large amount of laundry. It is particularly appropriate for the households with kids, babies, and pets. The technologies it brings definitely make LG WT1801HVA_DLEY1701V as the best top load washing machine from the brand. For those who are in search of a compact machine that can fulfill all laundry needs, LG WM3997HWA Ventless 4.3 Cu is the perfect one to buy. This front load washer has a combo with a dryer and comes in a small package. It also has all the technologies offered by all LG’s best front load washing machines from Steam Cleaning and Sanitary Cycle. It is called Ventless because it has a Ventless Condensing Drying which means it does not require ventilation to remove steam excess from the drying process. This also means you will need to check more about the lint filter and tray. Clean them regularly to get the maximum function of the machine. LG WM3997HWA Ventless 4.3 Cu has a TrueBalance™ system which makes the machine almost soundless when working. For comfort, LG WM3997HWA Ventless 4.3 Cu is suitable for LG washing machine pedestals to make it taller for easier access to the drum. Most of the users will find the Delay Wash features useful. It can process a load for up to 19 hours. Another advantage of the washing machine is that it uses less electricity, creating more energy efficiency for everyday use. Though it has both washer and dryer functions on one machine, the settings can be customized to either wash or dry function only. It might be a bit difficult for the new user to adjust with the settings of this machine. There are plenty of ways to use the function. It also has different settings for different kind of fabrics. To deal with it, you are suggested to follow the user manual carefully. The installation of the water input and output should also be a concern. As it already has a big capacity, it is not recommended to overload the machine. When overloaded with clothes, it may not work properly and leave your clothes damped. With two functions of washer and dryer in one machine, the LG WM3997HWA Ventless 4.3 Cu is just the best front load washing machine for smaller households. You can get the job done by using only one machine without having to move wet clothes in between washing and drying. Not to mention that the machine has a stylish square-rimmed glass door that can be a perfect match or your smart house. Just as Delay Wash feature takes a longer time to finish, you can do so much more while washing your clothes – which makes it the best one yet for busy people. 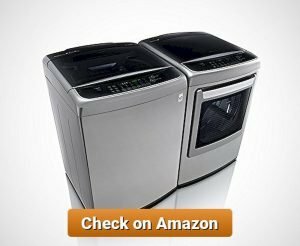 This washing machine is the best one to get if you have limited space in your house, apartment, or condominium. With a width of only 24 inches, LG WM3488HW is the best washing machine for laundry in small spaces. It is equipped with LG’s signature technologies like TrueBalance™ and LoDecibel™ for a quiet and smooth operation. Furthermore, the LG LoadSense™ can adjust water level as needed by the amount of laundry load. Despite the small size, the machine has all the features that bigger washing machine has to offer. One of the most useful features is the Delay Wash which is suitable for those who are living a busy lifestyle. With a long list of features, users need to find the best setting for the clothing. Besides, you need to notice that fabrics and clothing usually have their care instructions. So, each fabric will need to be treated differently. To make laundry easier, gather the same fabrics and colors and separate it before you go further into washing it. LG’s signature technologies promise an efficiency of energy and time with its TurboWash™ and Inverter Direct Drive Motor. The well-designed product will also enhance the look of your laundry room. The Ventless Condensing Dryer lets you dry clothes without having to build a vent connected to the machine. Furthermore, the clothes coming out of the dryer are well-dried, and all you need to do next is fold. As one of the best washing machine for laundry in its class, LG WM3488HW really offers performance and class to its users. The capacity doesn’t make it a good washing machine for big families. It is more suitable for small families or even single persons. The variation of function can be a stressful one to understand. To your need, you may find the best combination of function. It also doesn’t work well for clothes that have animal sheds or even fabrics that pets use. Though some people prefer twin tub washing machine, the one tub washing machine actually saves more time on doing laundry. The compact size will also be a great advantage especially for those who have limited space. On another note, the machine also has 14 washing options which will make it easier to find the suitable ones for your need. Among the combo types, LG WM3488HW is one of the best washing machines for laundry. It is designed well for young professionals who prefer a hassle-free washing machine. If you are looking for a washing machine that really cleans your laundry, Electrolux Perfect Steam EFLS617SIW is the answer. Stated as the top washing machine 2018, Electrolux Perfect Steam EFLS617SIW even cleans and dries your clothes in just 15 minutes. Thanks to SmartBoost technology, which will improve the detergent use each time you wash. This high technology washing machine from Electrolux is not like the other. As other modern washing machine tries to update their appliances with smartphone application or Bluetooth® connection, Electrolux stays as a washing machine that really does the cleaning. The big capacity doesn’t keep the washing machine from doing small loads of laundry. It works perfectly well as long as you don’t shove in more laundry that it can take. The wash cycles include heavy duty, whitest white, normal, casual, colors, fast wash, delicates, rinse and spin, and clean washer. The temperature settings will work with the StainTreat technology. It heats to a different temperature for a different stain. Chocolate, blood, juices – you name it, and Electrolux will clean it for you. There are not many washing machines that provide LCD control display on it. The display is there to make sure that you get the right setting for the laundry. Choose any stain from the setting of StrainTreat technology and it will prepare the right setting to remove it with the right amount of detergent and the right temperature. The technology removes stubborn stains and also removes almost 99.9% of bacteria when used in whitest white or heavy-duty settings. It doesn’t require many sophisticated features for Electrolux to be the top washing machine 2018. The washing machine is just perfectly adequate for most household laundry. Unlike any other washing machine that lacks fast washing options, Electrolux Perfect Steam EFLS617SIW offers a 15-minute wash for clothes with less stubborn stain. The machine also lets you choose a specific stain type to clean better. On the other side, the normal cycle takes up around 140 minutes. A quite longer duration compared to other front load washing machines, but it does clean the whole laundry to a wearable level. The machine comes with a user manual that seems rather complicated. The setting needs to be adjusted in details to get the machine working perfectly right with the types of stain you want to remove. However, this is not an issue once you figure out the perfect setting for your everyday use. The Electrolux Perfect Steam EFLS617SIW is the one to get if you are dealing with stains every day. Thus, the machine is suitable for those who like doing heavy sports or families with little children. Start your environmental-friendly life with the Electrolux Perfect Steam EFLS617STT. This luxurious looking washing machine is one of the best washing machine 2018. It does not only make your laundry room looks good, but it also cleans most stain from any fabrics. Comes with the SmartBoost™ technology, it uses an efficient amount of water and detergent which means less household waste. The solid body of the machine also guarantees its durability for everyday use. Electrolux is indeed the best brand you need if you are looking for home appliances that are reliable and classy at the same time. The sleek design brings the features that will make stain removal feels easier. The perfect capacity lets you wash the whole house’s laundry in one load. The washing drum has a cascading design on the inside, giving you a cleaner wash for the laundry. The types of wash cycle clean almost every type of fabric and stain you have. It includes heavy duty, normal, whitest white, colors, casual, fast wash, rinses and spin, delicates, and clean washer. Each temperature setting works with the cycle to remove a different kind of stains. The LED control display helps you to see the work you are doing with the laundry. It makes sure you don’t use a wrong setting for the laundry. This signature technology from Electrolux gives the machine an ability to mix the detergent with water before it hits the laundry. That way, the cleaning process can be started as early as the water fill in the tub, and optimally cleans the clothes. The smart technology adjusts the temperature, water level, and cycle to do the right job for the stain. The washing machine has each particular setting for stains like chocolate, blood, dirt and any other stain you can think of. All of the features are wrapped in a sturdy yet elegant titanium body. With both the appearance and performance, the washing machine is yet to be the best washing machine 2018. One of the best things that you can find in this washing machine is the two options of fast wash. In 15 and 18 minutes, you can easily toss light daily laundry to the machine and get it cleaned right away. On the normal round, it takes a longer time to wash a full load of laundry. However, the smart functions from Electrolux make the machine suitable for daily use and also heavy duty laundry. This Electrolux Perfect Steam EFLS617STT does not come with a dryer, which means you have to hang the clothes dry or opt out for a separated dryer instead. The separated machines also mean it will take more time to do a round of laundry. Other than energy and water saving, this one does not do too well on time savings. As the best washing machine 2018 list expanded, this machine is something to consider. The titanium body only adds more features to the washing machine’s smart functions. If you are looking for a washing machine that is perfect for removing every stain, Electrolux EFLS617STT is the perfect one. Front load washing machine is broadly admitted to having higher efficiency and effectiveness, so does Miele W3038 24 Front Load Washer. 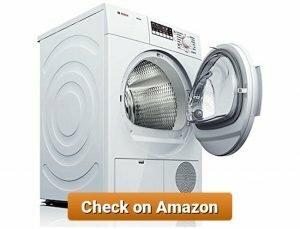 The following article will let you look at the main features, as well as the plus and minus points of the best front load washing machine that has become the favorite of many users. Equipped with advanced technology, this front load washer offers the best features to take care of your laundry works. The highest standard capacity in Europe can accommodate a larger amount of laundry at once. The patented surface structure for the machine interior improves cleaning performance and quality while providing gentle fabric care. The programs provide several options to handle regular types of fabric: Normal, Wrinkle-Free. Woolens, Silk, Hand Wash, Sanitize and Custom. For more advanced washing programs, Miele provides washing cycle for specific types of fabric: Denim, Delicates, Extra White, Outerwear, Table Linens, Pillows, Towels, and many more. With various adjustable modes and programs, Miele W3038 24 Front Load Washer offers excellent cleaning performance. It is accompanied by the washing machine’s flexibility that can go well with almost every kind of detergent without mistreating your clothes. Miele W3038 also has a relatively low water level that becomes another advantage since it treats any types of fabric gently and provides cleaner results, compared to similar types of a front loader. For more effective use, the custom cycle of Miele W3038 allows you to select a different spin speed and temperature setting based on your needs. If you value efficiency above all of those beneficial features, Miele W3038 is the best option for you because it is considered as an energy-efficient machine. Moreover, its compact size fits almost anywhere and can be arranged easily in your laundry room. Despite having numerous excellent features, Miele W3038 has several weaknesses regarding the program setting. It is true that this front load washing machine is equipped with a variety of different cleaning options. However, some available options cannot work properly with a certain setting. One example of this ineffective setting is the Express option. On the basic instruction, it lets you operate the machine for a quick 30-minute wash. Unfortunately, the Express option can only work alone, although it would be more effective if you can combine the option with pre-wash or extended wash for a better result. Another minus point that some people find it troublesome is the machine’s inability to change the option during the washing process. Once you set a particular program, the machine will lock up your option after it works for 5-6 minutes, so you cannot change your mind to set additional option, even when you need it. All in all, MieleW3038still serves as the best front load washing machine to fulfill all your needs when it comes to cleaning clothes. Since its features can handle various types of fabric with care, Miele W3038 is the perfect choice for those who own a large variety of cloth materials but do not want to visit the Laundromat to clean some specific fabric types. Blomberg is popularly known as a company that always produces functional washer and dryer with the latest technology. One of its products, Blomberg WM77120, has spread around the European and American market with a lot of positive feedbacks. Complete and compact package of Blomberg WM77120 washing machine puts it under the list of the best washing machine for laundry. The following are some features of Blomberg WM77120 12 Program 7 Kg. To support the basic washing cycle, Blomberg WM77120 is equipped with several special and additional functions, including Quick Wash, Prewash, Rinse+, and Anti-Creasing program. The heaters can be set from low to high water temperatures which result in better cleaning performance and improved the hygiene of the clothing, especially for baby clothes. A large amount of maximum spin speed provides the best process for washing your laundry. When it is activated, this practical and effective feature can keep your children and laundry safe by ignoring any alteration made to your selected wash settings. Blomberg WM77120 is a real space saver because of its compact shape and dimension. For that reason, you will not face any difficulty to arrange the washing machine in your laundry room. Another advantage of this compact washer is related to its flexibility when dealing with a large amount of laundry. If the machine is full-load, the interior drum uses its reversing direction to keep the laundry from bouncing while maintaining the cleaning performance. 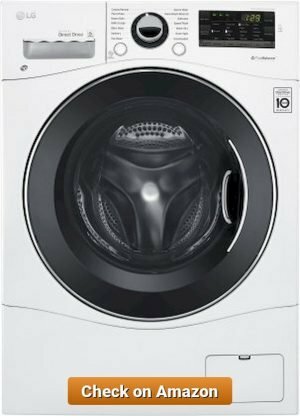 Following a number of excellent features mentioned earlier, Blomberg WM77120can handle various types of clothing materials with the maximum capacity of 7 kg laundry. Additionally, this washing machine is equipped with Child Lock function that can ignore any further alteration after you select and operate certain settings. 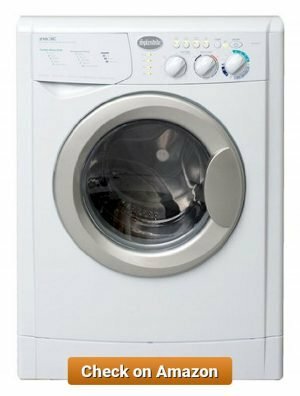 Although it can hold a surprising amount of clothes at once, Blomberg WM77120users encounter some difficulty when loading and unloading the laundry due to the lack of pedestal to raise the height of this compact washer. Another minus point of Blomberg WM77120 is related to the duration of its washing cycle. It takes a relatively long time to complete one cycle. Besides, when Dry Cycle is activated, this program takes almost 30 minutes to dry a single load of laundry. Despite its plus and minus points, it is a fair thing to say that Blomberg WM77120is the best washing machine for laundry which can fulfill the needs of every member of the family. Particularly, this washing machine is a must-have household equipment for families with babies and toddlers. In addition to its ability to handle baby clothing very well with Baby Protect program, Child Lock function in Blomberg WM77120 will make this machine works safely and effectively around the family. GE White Compact Laundry Pair consists of two complementary pieces: WCVH4800KWW 24” washer and DCVH480EKWW 24” electric dryer. The pair comes with Optional Stacking Kit that is specifically designed for washing and drying machine produced by General Electric. Excellent performance of this compact package can give you the best experience when doing laundry at home. Both the washer and electric dryer in GE White Compact Laundry Pair are equipped with excellent features. Here are some features of WCVH4800KWW 24” front-load whitewasher. HydroMotion Wash Option which provides gentle wash motion for better cleaning performance. Numerous wash cycles, providing the cycle programs to handle various washing needs, including speed wash, second rinse, and easy care. Internal water heater, the ultimate feature to reduce bacteria and remove tough stains. The washer’s best partner, GE DCVH480EKWW 24” electric dryer also has a number of beneficial features to complete the laundry process. Sensor Dry, monitoring temperature and measuring moisture to avoid over-drying. Multiple drying cycles and heat options, different programs to give you the best result of the laundry process. The heat and sanitize options are some real examples of advantageous features in GE White Compact Laundry Pair. Those options let you take care of dirty towels or white cotton sheets with a good cleaning process, so you can dispel the worry whether the clothes will be worn or discolored. The temperature setting is also helpful since you can adjust the heat level from warm to hot according to your clothes’ needs. Multiple options of spin speed with the maximum speed of 1400 rpm perform the best washing process while handling the clothes with gentle clean. The washing machine is also suitable for different choices of detergent. The better news is, it uses less amount of detergent compared to top load washer. The dryer is equally good. Numerous options and guided sensor are really beneficial for the effective and practical drying process. The features for washing and drying in GE White Compact Laundry Pair make are practical. However, the same thing cannot be said to the machine assembly. Besides the pair consisting of one washer and one dryer, you still need to pay separate purchase for the dryer cord before assembling the washer and dryer together. The arrangement which involves computer board setting is also considered a little bit complicated according to some users. It is worsened by the fact that GE White Compact Laundry Pair should be purchased along with special stacking kit if you want to stack both washer and dryer in one single space instead of placing them side by side. The kit is optional, though, so if you think it is troublesome, you can always avoid buying it. GE White Compact Laundry Pair is the right washing and drying machine for those who value practicality when doing laundry at home. This washing and drying machine is a great choice for homes in the city that are usually built in limited space. 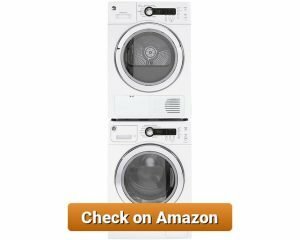 With a lot of features that support the excellent performance of this washer and dryer pair, it is not surprising that GE White Compact Laundry Pair is considered good enough to be put on the list of best washing machine 2018. Manufactured by Bosch while being paired up with white stackable electric dryer, Bosch WTB86200UC 300 4.0 Cu. comes with various features that will help you do the laundry in an easier and more practical way. 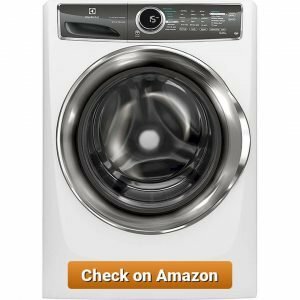 It is a complete package of washer and dryer that deserves to be put on the list of top washing machine 2018. Bosch White Stackable Electric Dryer provides numerous features which make it an excellent drying machine for your laundry needs. The following are some of the features owned by this electric dryer. 4 Cubic Foot Drum to accommodate a larger capacity of your laundry. Unique Drum Pattern to protect your clothes by providing air cushions. Moisture Sensor, an effective feature which prevents wasted laundry and over-drying. Intelligent Sensors, maintaining the machine from over-heating. 15 Dry Cycles, including Cotton Extra Dry-Dry-Damp, Perm Press Extra Dry-Dry-Damp, Sanitary, Delicates, Jeans, Quick Dry, Delicates, Heavy Duty, Time Dry, Woolens, and Air Fluff or No Heat option. Extended WrinkleBlock, preventing certain types of fabric from wrinkles by extended setting after the cycle is completed. 4 Temperature Settings to deal with different needs of various garment types. Large LED Display for better monitoring of remaining time in the drying process. Anti-Vibration Design, reducing the machine’s vibration and noise up to 30%. Ventless Condensing Drying System works effectively by removing the moisture of laundry through a hose without producing any heat. In addition to its numerous beneficial features, one obvious advantage of having Bosch White Stackable Electric Dryer as your household equipment is its practical and flexible installation. To complete the installation, the machine needs a specific adapter plug that is sold separately. However, such condition does not interfere with the installation process. Regular installation, including the vent outlet setting, can still be done in about 15 minutes. Moisture Sensor of this dryer is another plus point that gives you convenient service. It will prevent waster energy and over-drying, as well as keep your clothes away from weary fabric or colors. The stackable and space-saving Bosch White Stackable Electric Dryer is also equipped with Extra Fine Double Lint-Filter which makes you easier to clean the machine. The sensory system in White Stackable Electric Dryer is practically beneficial. Unfortunately, in some cases, the system can have the opposite result from its intended use. After detecting dry laundry load, the sensory system will automatically be turned off. At first, it sounds like an effective solution. However, the problem arises when you wash different sizes of clothes at once. The system which has recognized dry clothes with a smaller size will immediately shut itself, while clothes in bigger size have not dried completely. The same problem also occurs to different types of fabric when some types can dry quicker than the others. Bosch White Stackable Electric Dryer is the primary option for those who are looking for an electric dryer with easy installation and operation. This electric dryer also provides various options to dry different fabrics; from delicate to heavy and tough types. Westland Splendide WD2100XC White Vented Washer/Dryer is a complete package which can fulfill all your needs in laundry chores. Its large capacity, smooth performance, and space-saving dimension will surely ease your washing and drying process. This compact front loader serves you higher than any products cited on the list of best top load washing machine. Westland Splendide WD2100XC helps your laundry works get done easier and more convenient. The following are some of the outstanding features offered by this Washer and Dryer Combo. The maximum capacity is supported by durable stainless-steel drum, high-quality motor, and 1200 rpm speed. The latest technology of brushless motor takes the machine’s sound production to the lowest level, making it works with super quietness. For specific needs of every fabric type, the adjustable setting of water level and temperature can handle them all. The wash cycles let you set different programs for different types of garment, including silk, cotton, wool, delicates, and synthetics. Meanwhile, the dry cycles provide three drying options: rinse, spin, and drain. With multiple advanced features offered by Westland Splendide WD2100XC, it is quite surprising to admit that this washing machine can be operated with only several simple and easy steps. 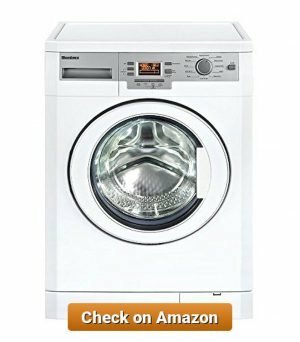 Getting started with this machine is as simple as selecting a particular cycle to wash, setting the time to dry, pressing the start button, and waiting for it to do all the works while you are enjoying your time. The design of Westland Splendide WD2100XC brings another plus point. In addition to its compact dimension, this washing/drying machine is supported by effective design, including soft-touch electronic knobs, exclusive option, and status displays, as well as an extra wide front door which makes you easier when loading and unloading the laundry. Compared to other washer/dryer package in similar types, Westland Splendide WD2100XC should be cleaned more often. This is due to the lack of lint screen which usually prevents dirt and dust from blocking certain parts of the machine, especially the vent. Therefore, to avoid excessive dirt that can lead to a clogged hose, regular maintenance cleaning is required. The express cycle with extra spin speed also has its own disadvantage. This mode causes the interior drum to spin extremely fast, making the clothes smash against the side of the wall and may result in clothes wrinkling, particularly when you wash or dry jeans and pants. To avoid such possibility, the low-spin option is more recommended since it provides safe washing treatment for almost all of your clothing types. Using any kind of liquid fabric softener is also helpful to overcome this wrinkling problem. Numerous convenient features, along with practical installation and operation, are the primary reasons why Westland Splendide WD2100XC is considered the best combo washer and dryer package for every home situation. This washer-dryer can fit in the laundry room at home, loft, apartment, condominium, and it is even suitable to be put inside an RV. Wherever you place Westland Splendide WD2100XC, its elegant design and excellent quality provide the best service to handle your laundry loads.